Over the last four-plus years the extended Yaku community has done what it can to patch the roof and floor—temporary band-aids so we can better assess the full task of preservation. Our "Floors and Doors" crowd-funding campaign was a big help and we (and the building) appreciate greatly all who participated—by donating funds and/or sweat. Check out the headway we have made for the building on our Progress page! Now, with feasibility study in hand, we have a much clearer picture as to what this preservation project is going to need. There are two main components—cost and time. And we are about out of time when it comes to saving this special building. Parallel to "bandaging" the building, Yaku has been busy seeking local funders and partners to help us preserve Hale Memorial, and to help us fulfill our Mission and Vision. Amplify our cause: Like us, follow us, share our posts and tweets—we're @yakupeoria—Facebook, Twitter, Instagram, and tell everyone you know that we're working to save the old church on Main Street. It may not seem like much, but it's helping. Investors and developers are listening and watching! Stay engaged: Yaku is always looking for volunteers, more people to continue to grow our community. Take a look at our Community page and fill out the form at the bottom of the page! Are you a potential donor or investor? We would love to hear from you! Send us an email: yakupeoria@gmail.com. Think of all that this building has seen (and hopefully will see). 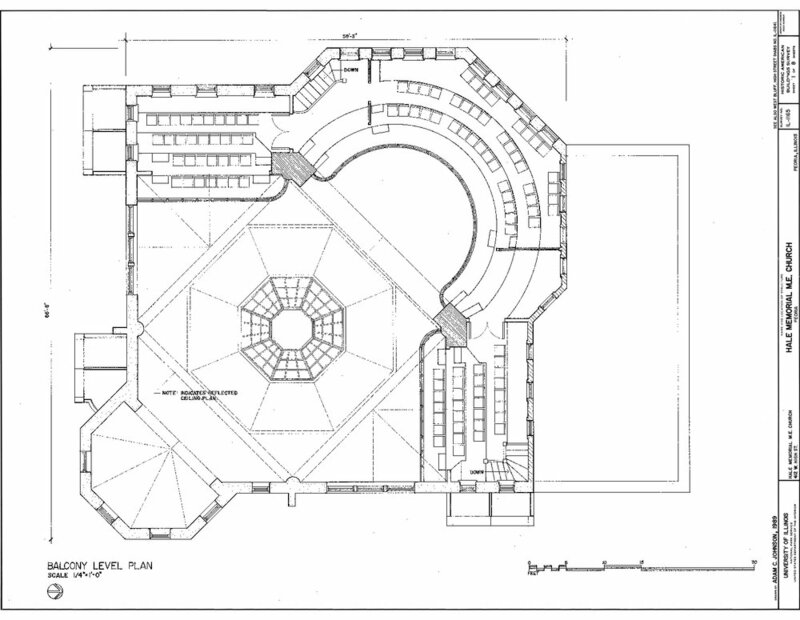 These floor plans, drawn by Adam C. Johnson (University of Illinois, 1989) make it hard not to imagine all the possibilities this building offers. For those lucky enough to have been inside, whether 50 years ago or even in its current condition, the imagination takes on a whole other dimension. Do you have ideas or dreams of using this building? We'd like to hear them! All Treasure This Place Love Save! Treasure This Place Love Save!